Police have released CCTV images of a man they want to trace in connection with a robbery at a bookmakers in South Ayrshire. A worker at the shop was threatened with a weapon during the raid on Ladbrokes in High Street, Maybole, on 8 October. The male robber left with a three-figure sum after the incident at about 17:35, police said. He then drove off in a light-coloured car towards John Knox Street. 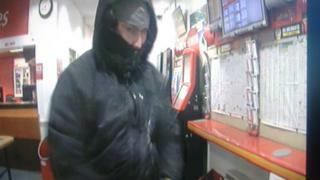 The man is described as white, in his early 40s, with stubble and was wearing a dark jacket with the hood up. Police have appealed to anyone with information about the incident to contact them.